When North Korean state media reported in December 2011 that leader Kim Jong-il had died at the age of 70 of a heart attack from “overwork,” I was a relatively new analyst at the Central Intelligence Agency. Everyone knew that Kim had heart issues—he had suffered a stroke in 2008—and that the day would probably come when his family’s history of heart disease and his smoking, drinking, and partying would catch up with him. His father and founder of the country Kim Il-sung had also died of a heart attack in 1994. Still, the death was jarring. While North Koreans wept, fainted, and convulsed with grief, feigned or not, Kim Jong-un, the twenty-something-year-old son of Kim Jong-il, reportedly closed the country’s borders and declared a state of emergency. News of these events began to filter out to the international media through cell phones that had been smuggled in before Kim Jong-il’s death. There had been signs before 2011 that Kim was grooming his son for the succession: he began to accompany his father on publicized inspections of military units, his birth home was designated a historical site, and he began to assume leadership titles and roles in the military, party, and security apparatus, including as a four-star general in 2010. What sort of person was Kim Jong-un? Would he even want the burden of being North Korea’s leader? And if so, how would he govern and conduct foreign affairs? What would be his approach to the nuclear weapons program that he inherited? Would the elites accept Kim? Or would there be instability, mass defections, a flood of refugees, bloody purges, a military coup? Predictions about Kim’s imminent fall, overthrow, or demise were rife among North Korea and Asia watchers. Surely, someone in his mid-20s with no leadership experience would be quickly overwhelmed and usurped by his elders. 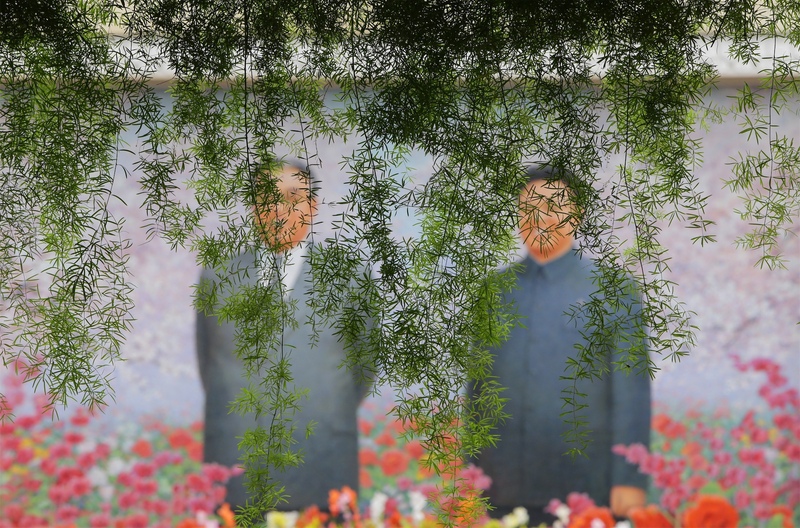 There was no way North Koreans would stand for a second dynastic succession, unheard of in communism, not to mention that his youth was a critical demerit in a society that prizes the wisdom that comes with age and maturity. And if Kim Jong-un were to hold onto his position, what would happen to his country? 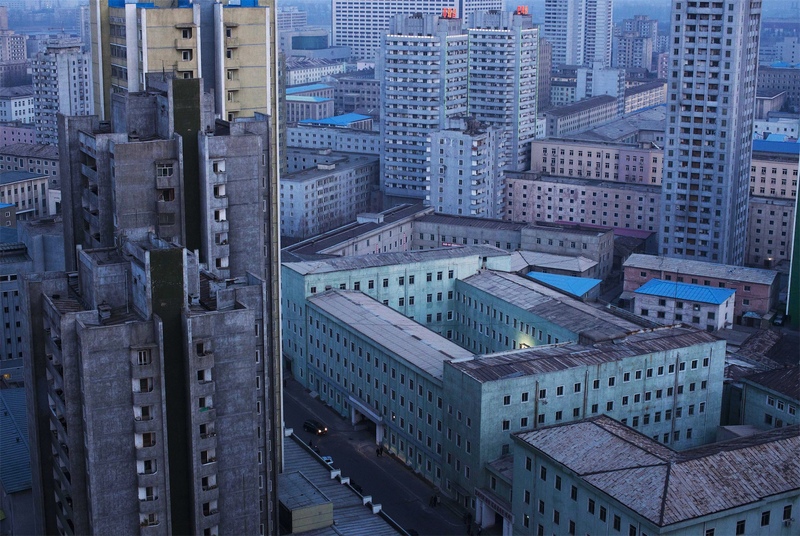 North Korea was poor and backward, isolated, unable to feed its people, while clinging to its nuclear and missile programs for legitimacy and prestige. Under Kim Jong-un, the collapse of North Korea seemed more likely than ever. In the six years since, Kim has collected a number of honorifics, cementing his position as North Korea’s leader. Kim has carried out four of North Korea’s six nuclear tests, including the biggest one, in September 2017, with an estimated yield between 100-150 kilotons (the atomic bomb dropped on Hiroshima, Japan during World War II was an estimated 15 kilotons). He has also tested nearly 90 ballistic missiles, three times more than his father and grandfather combined. North Korea now has between 20 and 60 nuclear weapons and has demonstrated ICBMs that appear to be capable of hitting the continental United States. It could also be on track to have up to 100 nuclear weapons and a variety of missiles—long-range, road-mobile, and submarine-launched—that could be operational as early as 2020. Under Kim, North Korea has conducted major cyberattacks and reportedly used a chemical nerve agent to kill Kim’s half-brother at an international airport. The last six years have also seen Kim dotting the North Korean landscape with ski resorts, water parks, and high-end restaurants to showcase the country’s modernity and prosperity to internal and external audiences. They are also meant to deliver on his promise to improve the people’s lives—as part of his byungjin policy of developing both the economy and nuclear weapons capabilities—and to attract foreign tourists. Yet even as he is modernizing his country at a furious pace, Kim has deepened North Korea’s isolation. Having rebuffed U.S., South Korean, and Chinese attempts to reengage, he has refused to meet with any foreign head of state, and so far as is known, since becoming leader his significant foreign contacts have been limited to Kenji Fujimoto, a Japanese sushi chef whom he knew in his youth and whom he invited to Pyongyang in 2012, and Dennis Rodman, an American basketball player, who has visited North Korea five times since 2013. Kim Jong-un is here to stay. The pace of weapons testing is speeding up. Kim Jong-un has already tested nearly three times more missiles than his father and grandfather combined. North Korea is what we at the CIA called “the hardest of the hard targets.” A former CIA analyst once said that trying to understand North Korea is like working on a “jigsaw puzzle when you have a mere handful of pieces and your opponent is purposely throwing pieces from other puzzles into the box.” The North Korean regime’s opaqueness, self-imposed isolation, robust counterintelligence practices, and culture of fear and paranoia provided at best fragmentary information. Intelligence analysis is difficult, and not intuitive. The analyst has to be comfortable with ambiguity and contradictions, constantly training her mind to question assumptions, consider alternative hypotheses and scenarios, and make the call in the absence of sufficient information, often in high-stakes situations. To cultivate these habits of mind, we were required to take courses to improve our thinking. Walk into any current or former CIA analyst’s office, and you will find a slim, purple book by Richards Heuer with the title Psychology of Intelligence Analysis. 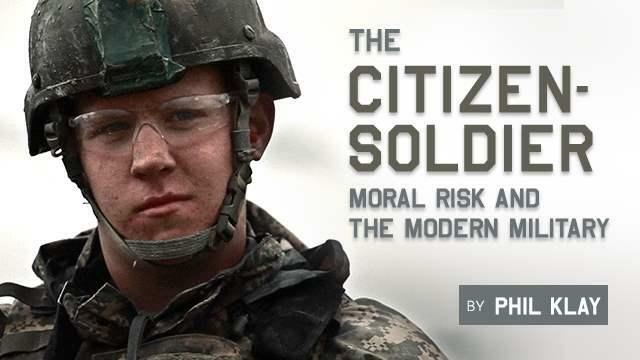 This is required reading for CIA analysts. It was presented to us during our initial education as new CIA officers and often referred to in subsequent training. It still sits on my shelf at Brookings, within arm’s reach. When I happen to glance at the purple book, I am reminded about how humility is inherent in intelligence analysis—especially in studying a target like North Korea—since it forces me to confront my doubts, remind myself about how I know what I know and what I don’t know, confront my confidence level in my assessments, and evaluate how those unknowns might change my perspective. Heuer, who worked at the CIA for 45 years in both operations and analysis, focused his book on how intelligence analysts can overcome, or at least recognize and manage, the weaknesses and biases in our thinking processes. 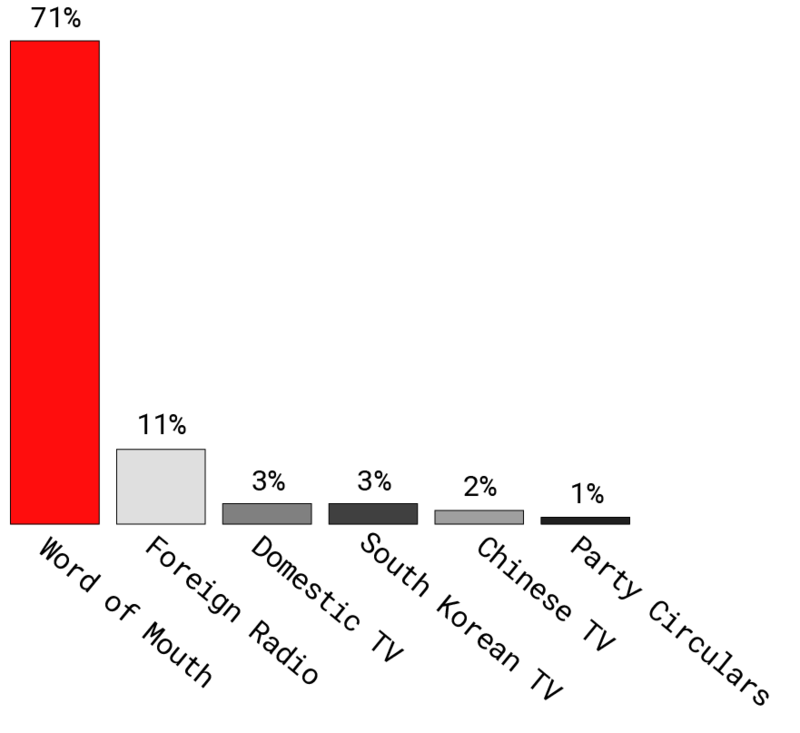 One of his key points was that we tend to perceive what we expect to perceive, and that “patterns of expectations tell analysts, subconsciously, what to look for, what is important, and how to interpret what is seen.” The analyst’s established mindset predisposes her to think in certain ways and affects the way she incorporates new information. What, then, are the expectations and perceptions that we need to overcome to form an accurate assessment of Kim Jong-un and his regime? Given the over-the-top rhetoric from North Korea’s state media, Kim’s own often outrageous statements, and the hyperbolic imagery and boastful platitudes perpetuated by the ubiquitous socialist realism art, it has been only too easy to reduce Kim to caricature. That is a mistake. When the focus is on Kim’s appearance, there’s a tendency to portray him as a cartoon figure, ridiculing his weight and youth. 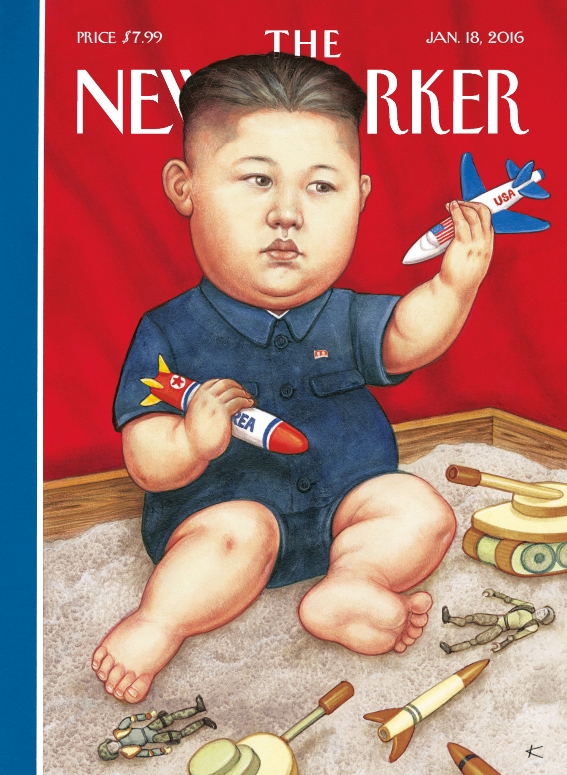 Kim has been called—and not just by our president—“Rocket Man,” “short and fat,” “a crazy fat boy,” and “Pyongyang’s pig boy.” A New Yorker cover from January 18, 2016, soon after North Korea’s fourth nuclear test, portrayed him as a chubby baby, playing with his “toys”: nuclear weapons, ballistic missiles, and tanks. The imagery suggests that, like a child, he is prone to tantrums and erratic behavior, unable to make rational choices, and liable to get himself and others into trouble. However, when the focus is on the frighteningly rapid pace and advancement of North Korea’s cyber, nuclear, and conventional capabilities, Kim is portrayed as a ten-foot-tall giant with untold and unlimited power: unstoppable, undeterrable, omnipotent. The coexistence of these two sets of overlapping perceptions—the ten-foot-tall baby—has shaped our understanding and misunderstanding of Kim and North Korea. It simultaneously underestimates and overestimates Kim’s capabilities, conflates his capabilities with his intentions, questions his rationality, or assumes his possession of a strategic purpose and the means to achieve his goals. 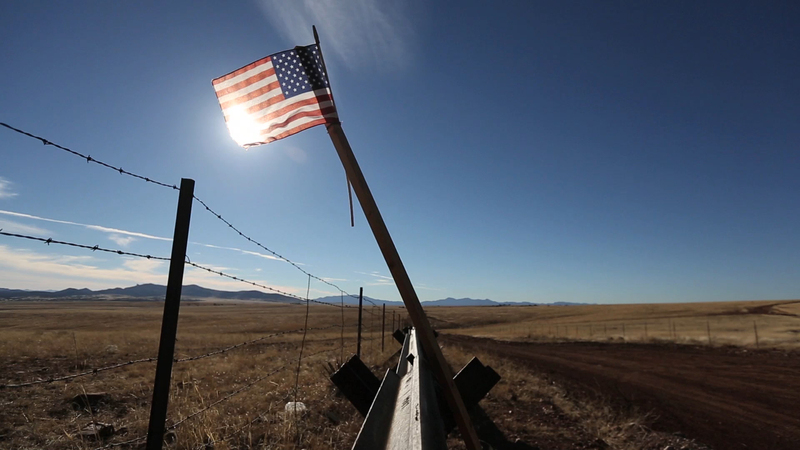 These assumptions distort and skew our policy discussions. 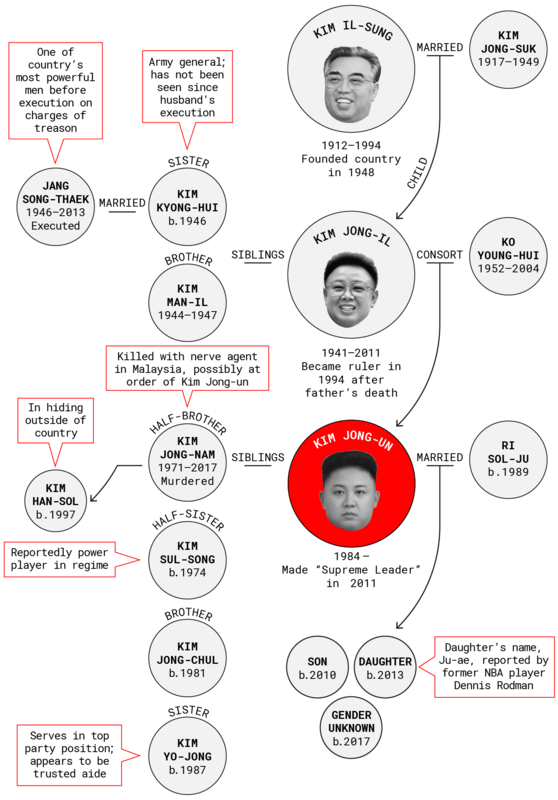 If he had followed Korean custom and tradition, Kim Jong-il would have named Kim Jong-nam, not Kim Jong-un, his successor, because Jong-nam was the eldest of his three sons. But Kim Jong-il reportedly rejected Jong-nam as being unfit to lead North Korea. Why? For one, the elder Kim might have judged that Jong-nam was tainted by foreign influence. In 2001 Jong-nam had been detained in Japan with a fake passport in a failed attempt to go to Tokyo Disneyland. More seriously, it is said that he had suggested that North Korea undertake policy reform and open up to the West, enraging his father. The second son, Jong-chul, was deemed too effeminate; one of Jong-chul’s friends recalled that “[Jong–chul] is not the type of guy who would do something to harm others. He is a nice guy who could never be a villain.” Indeed, he seems to be playing an unspecified supporting role in his younger brother’s regime. *North Korea’s secrecy makes it difficult to verify information about Kim Jong-un’s children, including how many there are and when they were born. His wife’s birth date is also unconfirmed. That left Jong-un, whom the elder Kim chose to be the third Kim to lead North Korea because he was the most aggressive of his children. Kenji Fujimoto, Kim Jong-il’s former sushi chef, who visited Pyongyang at the request of Kim Jong-un, has provided some of the most fascinating firsthand observations about Jong-un and his relationship with his father. 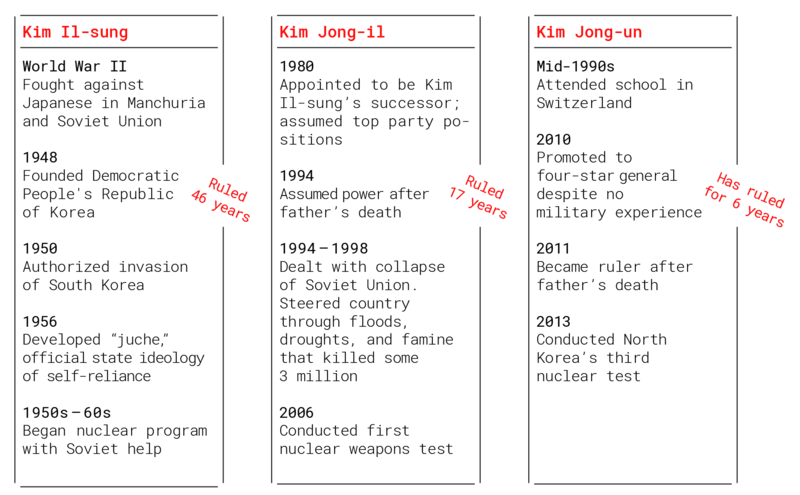 Fujimoto claims that Jong-il had chosen his youngest son to succeed him as early as 1992, citing as evidence the scene at Jong-un’s ninth birthday banquet where Jong-il instructed the band to play “Footsteps” and dedicated the song to his son: Tramp, tramp, tramp; The footsteps of our General Kim; Spreading the spirit of February [a reference to Kim Jong-il, who was born in February]; We, the people, march forward to a bright future. Judging from the lyrics, Jong-il was expecting Kim Jong-un to lead North Korea into the future, guided by the spirit and legacy of his father. 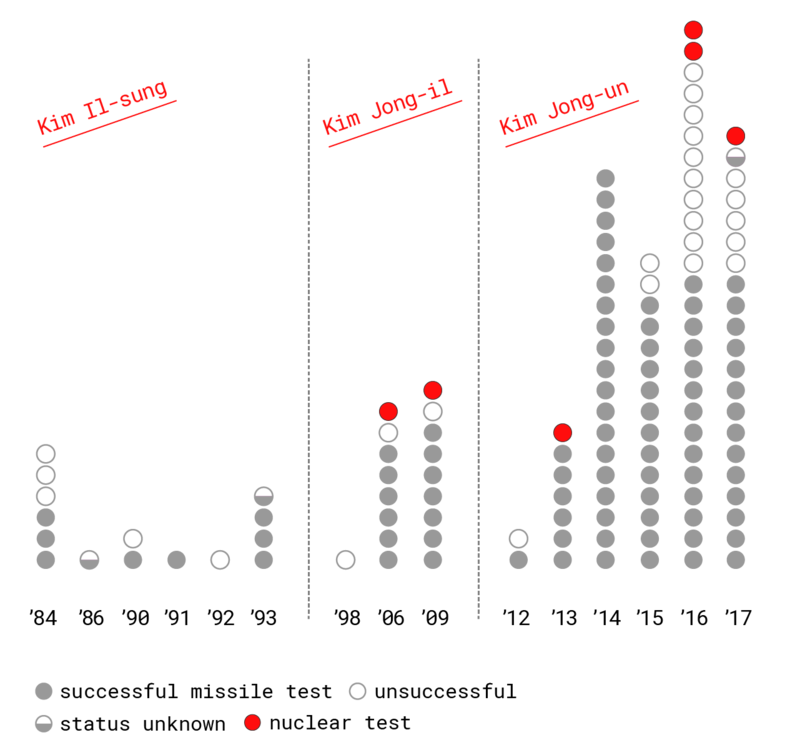 Though Jong-il saw in his son a worthy successor to the dynasty, there are critical differences between the first two Kims and Kim Jong-un. Kim Il-sung, the country’s founder and Jong-un’s grandfather who ruled for nearly five decades until his death in 1994, was a revolutionary hero who fought Japanese imperialism, the South Korean “puppets,” and the American “jackals” in a military conflict that ended only because of an armistice. In the next generation Kim Jong-il had to navigate through world-changing events that included the collapse of the Soviet Union and the subsequent end of large-scale aid from Moscow, a changing relationship with the ever-suspicious Chinese who seemed to be prioritizing links with Seoul, and tense negotiations with the United States on North Korea’s burgeoning nuclear program. And let’s not forget the famine and the drought of the 1990s, or the tightening noose of sanctions and international ostracism. 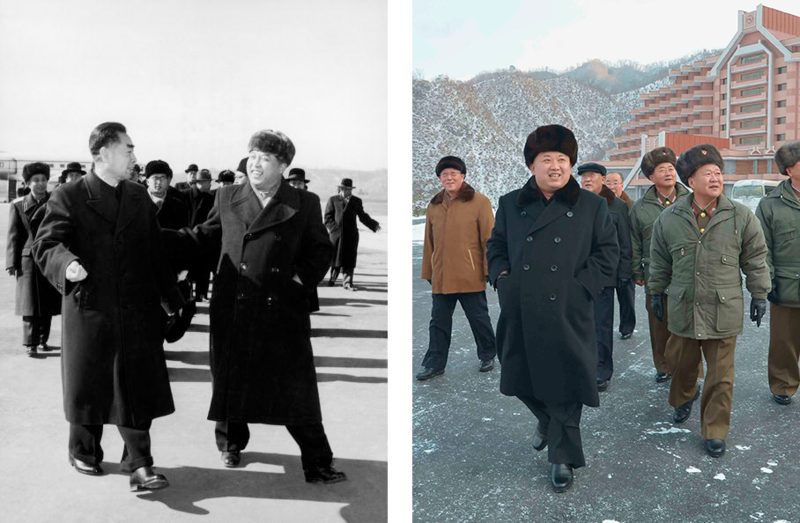 In contrast with his battle-hardened elders, Kim Jong-un grew up in a cocoon of indulgence and privilege. Kim Jong-un has a well-known love of basketball. According to a GQ interview, it began when a Japanese contact sent him VHS tapes of Chicago Bulls‘ playoff games. 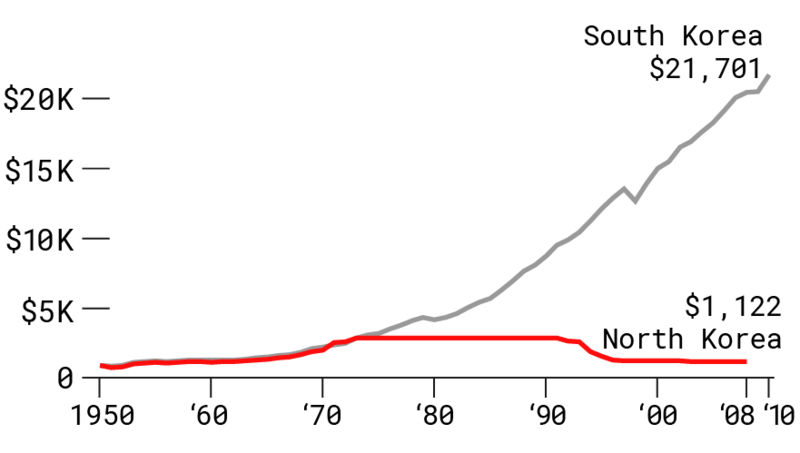 During the 1990s famine, in which as many as 2–3 million North Koreans died as a result of starvation and hunger-related illnesses, Kim was in Switzerland. His childhood was marked by luxury and leisure: vast estates with horses, swimming pools, bowling alleys, summers at the family’s private resort, luxury vehicles adapted so that he could drive when he was 7 years old. For Kim, skiing in the Swiss Alps and swimming in the French Riviera must have seemed part of his birthright. Kim had a temper, hated to lose, and loved Hollywood movies and basketball player Michael Jordan. Despite his apparent lack of seriousness, Jong-un seems to have known from early on that, as his father’s chosen successor, he was destined to lead. His strong self-esteem and confidence were cultivated beginning when he was very young. 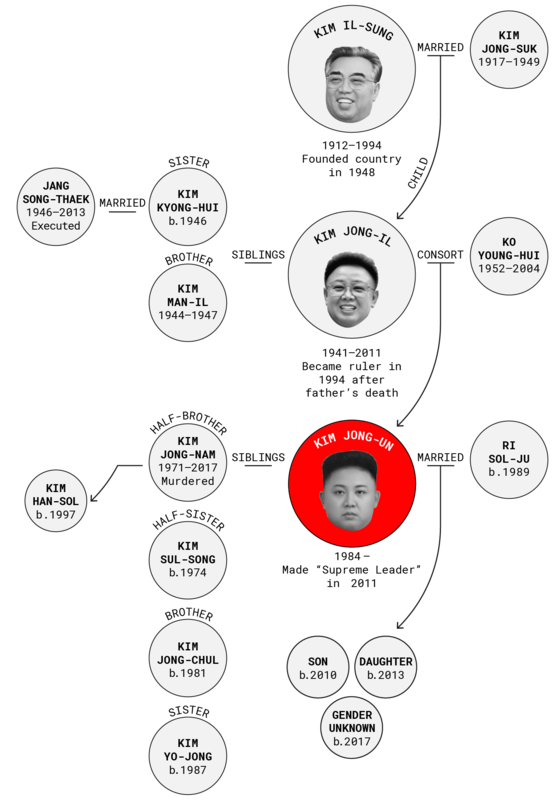 And the Kim family dynasty—a totalitarian regime—carefully created a cult of personality around the young boy, as it had done with his father and grandfather before him, reinforcing it through fear and intimidation and shows of force. Kim’s aunt said that at his eighth birthday party, he wore a general’s uniform with stars, and the real generals with real stars bowed to him and paid their respects to the boy. According to Fujimoto, Kim carried a Colt .45 pistol when he was 11 years old and dressed in miniature army uniforms. 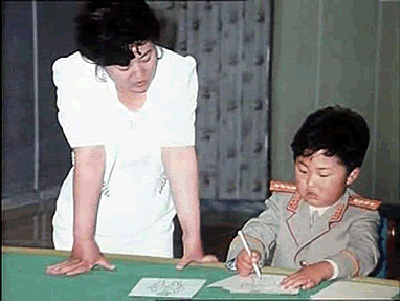 So, while small armies of teachers, tutors, cooks, assigned playmates, bodyguards, relatives, and chauffeurs developed Kim’s sense of entitlement and shielded him from the realities of North Korea and the world beyond when he was a child, the concept of juche (self-reliance) and suryong (Supreme Leader) would provide the ideological and existential justification for his rule when it came time for him to assume the mantle of leadership. The regime’s propaganda machine constructed and promoted the mythology, extolling his wisdom, his martial prowess, and his near supernatural capabilities, an example of which was his supposed ability to drive at age three. In October 2006, when Kim Jong-un was in his early twenties and two months away from his graduation from Kim Il-Sung Military University (which he had reportedly attended since 2002), North Korea conducted its first nuclear test, providing the Kim dynasty with yet another layer of protection, further steeping the nation in the Kim family mythology of supreme power, and further warping the young Jong-un’s sense of reality and expectations. That nuclear test, and his grandfather’s and father’s commitment to nuclear weapons, would also, however, narrow his choices once he took power, boxing him into the conviction that the fate of the nation and its 25 million people rested on his carrying forward this legacy. The young Kim and his classmates at the military university—the future military elite—no doubt celebrated that nuclear milestone, which probably also fortified their optimism about their country’s nuclear future and reinforced their belief in their role as the defenders of that future. 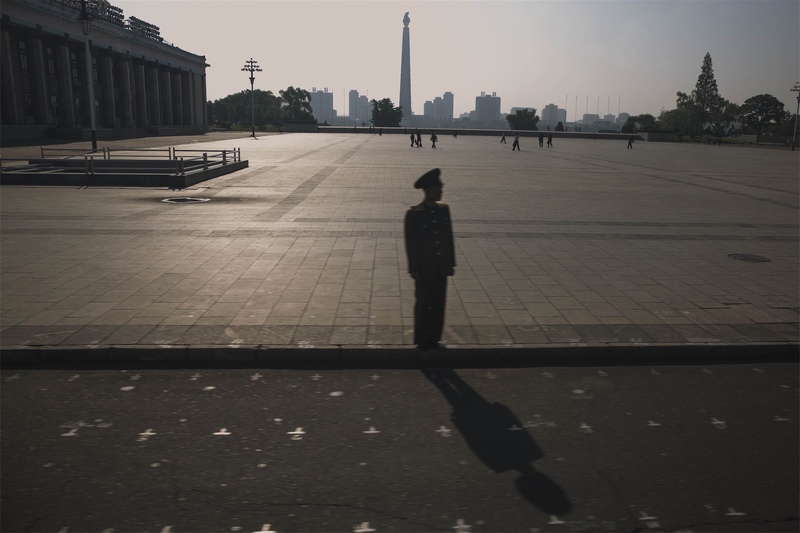 An estimated 200,000 North Koreans are held in some 30 prison camps across the country. As a scholar of U.S. history before I became an intelligence analyst, I couldn’t help but think about Andrew Carnegie’s famous statement about the third generation in America as Kim 3.0 took the reins of power in North Korea. “There are but three generations from shirt sleeves to shirt sleeves.” Or in other words, the first generation makes the money, the second generation maintains it, and the third squanders it. Kim Jong-un seems determined to avoid that fate. Kim has adopted the mantle of the mythical, godlike leadership role that grandfather and country founder Kim Il-sung and his father Kim Jong-il held and continue to hold in their death. But he seems determined to chart his own path. In short, this is not your grandfather’s dictatorship. 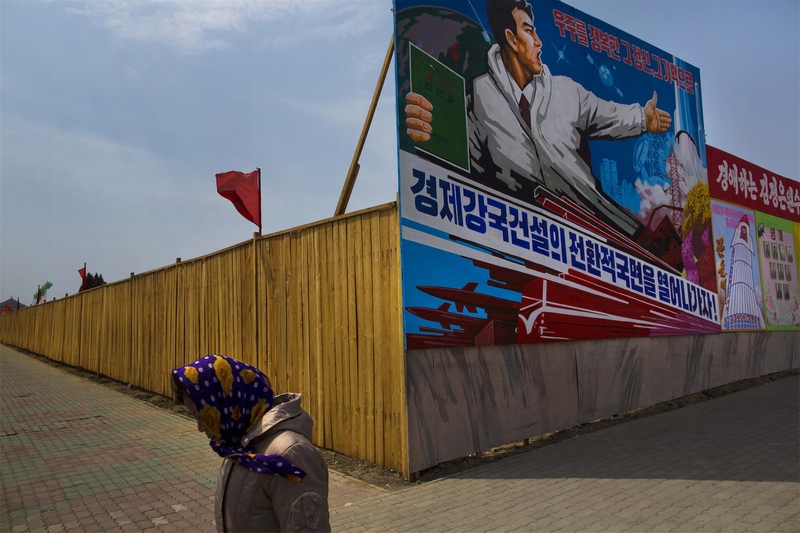 Kim is however harnessing the nostalgia for his grandfather’s era, before the 1990s famine and the collapse of the Soviet Union and the resulting termination of aid. With his uncanny likeness to his grandfather in both appearance and demeanor, he has skillfully exploited the country’s adulation of its founder. Just a few months after he became the leader of North Korea, on the 100th anniversary of his grandfather’s birth, Kim delivered his first public address. As he invoked his grandfather’s legacy in the lengthy, 20-minute speech, he also affirmed his father’s “military first” policy, proclaiming that “the days are gone forever when our enemies could blackmail us with nuclear bombs.” Yet even while endorsing his father’s policy, he was making a remarkable departure from his father’s practice, for this was the first time that North Koreans had heard their leader’s voice in a public speech since Kim Il-sung’s days: Kim Jong-il shunned speaking in public during his almost 20 years of rule. While basking in the nostalgia for his grandfather, Kim Jong-un is also determined to be seen as a “modern” leader of a “modern North Korea.” His charting of his own path can be seen in another departure from his father’s public persona. Kim has allowed himself to seem more transparent and accessible than his father. He appears in public with his pretty and fashionable young wife, Ri Sol-ju (with whom he has at least one child, and possibly three). He hugs, holds hands, and links arms with men, women, and children, seeming comfortable with both young and old. That transparency has been extended to the government. When one of its satellite launches failed in April 2012, the regime admitted the failure publicly, the first time it had ever done so. During his frequent public appearances, Jong-un can be seen giving guidance at various economic, military, and social and cultural venues, as his father and grandfather did, but he is also shown pulling weeds, riding roller coasters, navigating a tank, and galloping on a horse. He is comfortable with technology in the form of cell phones and laptops, and is also portrayed speaking earnestly with nuclear scientists and overseeing scores of missile tests. Kim appears to want to reinforce the impression that he is young, vigorous, on the move—qualities that he attributes to his country as well. Speaking directly to the people in April 2012 in that first public speech he gave as their leader, he confidently promised that North Koreans would no longer have to tighten their belts. Later he announced his byungjin policy: that North Korea can have both its nuclear weapons and prosperity. Animated by the optimism of one whose privilege made him believe anything was possible, he has prioritized both these issues and personally taken ownership of them—all part of creating and nurturing his brand. The images that the regime chooses to disseminate and weave into Kim’s hagiography say a lot about how Kim envisions North Korea’s future and his place in it. The carefully curated public appearances of Kim’s wife, Ri Sol-ju, provide the regime with a “softer” side, a thin veneer of style and good humor to mask the brutality, starvation, and deprivation endured by the people, while reports about the existence of possibly multiple children hint at Kim and his wife’s fecundity and the potential for the birth of another male heir to the Kim family dynasty (although I wouldn’t rule out the possibility for Kim to choose a daughter to lead North Korea, given his “modern” tendencies). For the toiling masses as well as for the elite, Ri, the glamorous and devoted wife, is an aspirational figure. To outside scholars, Ri’s public appearances offer something else—a glimpse of an emerging material and consumer culture, which Kim seems to be actively promoting. Even as tension with the United States went into overdrive after a sixth nuclear test and the launch of numerous ballistic missiles during the summer and fall of 2017, state media showed Kim and his wife touring a North Korean cosmetics factory. He reportedly urged the industry to be “world competitive,” praised the factory for helping women realize their dream of being beautiful, and offered his own comments on the packaging. Of course, Kim still has enormous power and, like his father and grandfather, the willingness to hold onto it through extreme brutality. He maintains control through purges and executions—punishments and acts of revenge he appears to inflict with relish. In the six years of his reign the regime has purged, demoted, “reeducated,” and shuffled scores of senior leaders. 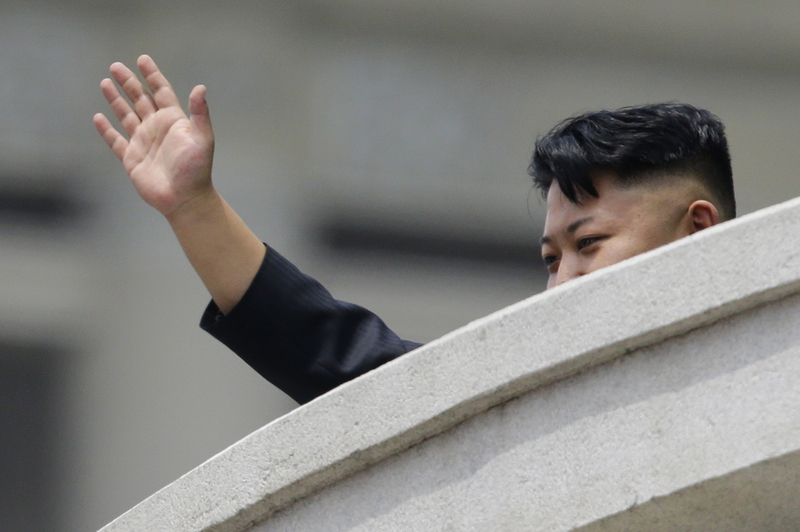 Between 2011 and 2016, Kim Jong–un reportedly ordered scores of executions—sometimes for trivial reasons such as half–hearted clapping and sleeping in a meeting. 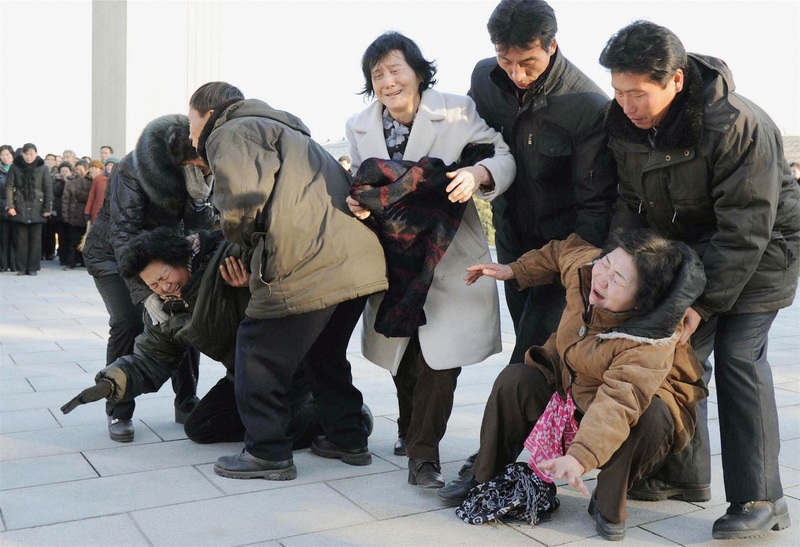 There was also the spectacularly shocking public humiliation of Kim’s uncle Jang Song-thaek in 2013, who was labeled “human scum” and “worse than a dog” and then reportedly executed by an anti-aircraft gun for allegedly undermining the “unitary leadership of the party” and “anti-party and counterrevolutionary factional acts.” Kim probably also ordered the deadly attack by the application of a VX nerve agent—one of the most toxic of the chemical warfare agents—against Jong-nam, his half-brother and erstwhile competitor for the position of supreme leader of North Korea. Captured on camera, the attack occurred in Malaysia’s airport, and images of Jong-nam’s gruesome death were circulated around the world. Kim has made it clear that he will not tolerate any potential challengers. And his rule through terror and repression—against the backdrop of that pastel wonderland of waterparks—means that the terrorized and repressed will continue to feed Kim’s illusions and expectations, his grandiose visions of himself and North Korea’s destiny. For the past six years, Kim has poked and prodded, testing and pushing the boundaries of international tolerance for his actions, calculating that he can handle whatever punishment is meted out. To a large extent, he has maintained the initiative on the Korean Peninsula, to the frustration of the United States and his neighbors. And as the U.S. and the international community have imposed ever stricter sanctions, Kim has chosen to double down on his nuclear weapons despite the financial consequences and the increasing international isolation. 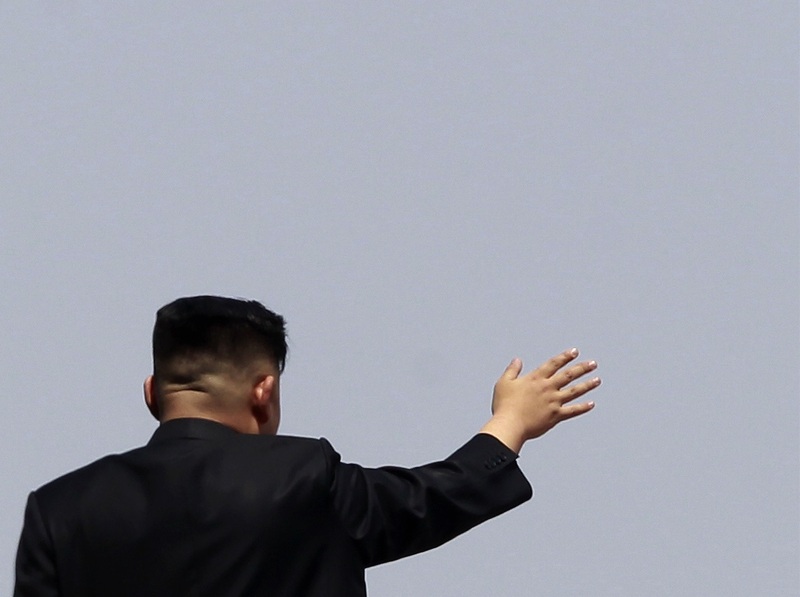 Just two weeks after North Korean negotiators agreed to the 2012 Leap Day deal with the U.S., which called for a moratorium on Pyongyang’s nuclear and ballistic missile tests in exchange for food aid, the new Kim regime announced its intention to conduct a space launch, using the same ballistic missile technology banned by sanctions. Although that space launch failed, North Korea, despite international condemnation of the April test, had success with its next attempt, when it launched a satellite into orbit in December 2012. 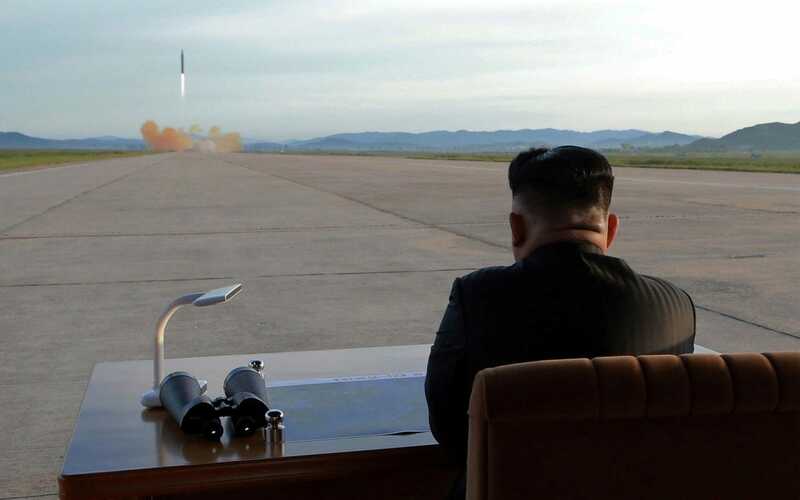 By portraying Kim Jong-un as a hands-on leader who personally ordered the rocket launch from a satellite command center, the state media framed their new leader as bold and action-oriented even in the face of widespread international censure. Two months later in February 2013—just a little over a year into Kim’s rule—North Korea conducted its third nuclear test, and Kim’s first. Under Kim, North Korea has pressed the accelerator on nuclear and missile development and has codified its status as a nuclear-armed state by inscribing that description into the revised constitution it issued in 2012. It has also reinforced Kim’s role in advancing these nuclear capabilities, further solidifying his authority over their use. Kim has overseen three more nuclear tests, and debuted and tested new ballistic missiles of various ranges from multiple locations, including a submarine-launched ballistic missile and, in July and November 2017, intercontinental ballistic missiles. In November 2017, North Korea tested intercontinental ballistic missiles with a potential reach of 8,000 miles–putting the entire United States in range. While Kim has been developing and demonstrating advanced nuclear weapons capabilities, he has also focused on diversifying the North’s toolkit of provocations to include cyberattacks, the use of chemical and biological weapons, and the modernization of North Korea’s military, which is among the world’s largest armed forces with over 1 million warriors. Kim has presided over high-profile artillery firepower demonstrations, been captured in photographs poring over military plans purported to depict attacks against the United States and South Korea, and has issued inflammatory threats in response to U.S. and international pressure. The rhetoric has also extended to threats against those who create negative portrayals of North Korea in popular culture. For example, in 2014, the regime said that the release of the movie The Interview—a comedy depicting an assassination attempt against Kim—would constitute “an act of war”; North Korean hackers threatened 9/11-type attacks against theaters that showed the film. Although a 9/11-type event did not happen, the regime made it clear through a cyberattack that insults against Kim and North Korea would not be tolerated and that the financial consequences for the perpetrators would be dire. North Korean hackers destroyed the data of Sony Pictures Entertainment, the company responsible for producing the film, and dumped confidential information, including salary lists, nearly 50,000 Social Security numbers, and five unreleased films onto public file-sharing sites. North Korea’s army of cyber–disruptors–operating abroad in China, Southeast Asia, and other places–continues to expand its capabilities. Yet, despite all the chest-thumping and bad behavior, Kim is not looking for a military confrontation with the United States. He is rational, not suicidal, and given his almost-certain knowledge of the significant deficiencies in North Korea’s military capacity, he is surely aware that North Korea would not be able to sustain a prolonged conflict with either South Korea or the U.S. Although Kim is aggressive, he is not reckless or a “madman.” In fact, he has been learning how and when to recalibrate. And it is his ability to recalibrate, change course, and shift tactics that requires us to heed Heuer’s warnings about the “weaknesses and biases in our thinking process” and continually challenge our assumptions and perceptions about “patterns of expectations” in North Korea analysis. We have to learn how to incorporate new information about what is driving Kim Jong-un and how we might counter this profound—and ever evolving—national security threat. It is true that Kim has been emboldened since 2011, and he’s gotten away with a lot: scores of missile test launches, nuclear tests, the probable VX nerve agent attack against his half-brother in Malaysia, a 2015 incident involving a landmine in the DMZ, the Sony hack in 2014 in which North Korean entities wiped out half of Sony’s global network in response to the release of The Interview, and the mistreatment and death of U.S. citizen Otto Warmbier, a student tourist who was detained and sentenced to 15 years of hard labor for alleged hostile acts against the North Korean state. However, Kim has carefully stopped short of actions that might lead to U.S. or allied military responses that would threaten the regime. That said, he has also been firm in his insistence that he will not give up North Korea’s nuclear weapons, regardless of threats of military attacks or engagement. It is clear that he sees the program as vital to the security of his regime and his legitimacy as the leader of North Korea. He may well be haunted by a very real fear of the consequences of unilateral disarmament. If we unpack this comparison, we can envision how deeply Kim Jong-un might have been affected by the death of Libyan leader Muammar Qaddafi. The once “king of kings in Africa,” who ruled Libya for four decades, was captured by rebels in October 2011, a date well into the process of grooming Kim for leadership and just two months before Kim Jong-il’s death. Graphic images of the bloodied Qaddafi ricocheted around the world. Contemporary reports described how Qaddafi was captured, hacked and beaten by a mob, shirtless and bloody, his body then stored in a freezer. Moreover, Qaddafi’s death occurred during the so-called Arab Spring, when a wave of popular protests against authoritarian regimes convulsed the Middle East and North Africa between 2010 and 2011. The overthrow of regimes hitherto believed to be invincible probably highlighted for Jong-un the potential consequences of showing any signs of weakness, and reinforced the brutal suppression of dissent practiced by the Kim dynasty. North Korea’s highly provocative actions in the summer and fall of 2017—demonstrating ICBMs, conducting a test of a probable thermonuclear device, and threatening to detonate a hydrogen bomb over the Pacific—suggest that Kim’s confidence has grown over the past six years. After all, he has outlasted both South Korean president Park Geun-hye and President Barack Obama. Perhaps he thinks he can out-bully and out-maneuver President Donald Trump and Chinese President Xi Jinping as well. Such confidence may be bolstered by the fact that Kim has yet to face a real “crisis” of the kind his father and grandfather had to confront and manage. He has relied on military demonstrations and provocative actions to get his way, and has no experience in the arts of negotiation, compromise, and diplomacy. Given the steady drumbeat of internal purges, the sidelining of North Korea’s diplomats since 2011 because of Kim’s focus on advancing his nuclear weapons program and conventional capabilities, and Kim’s apparent reveling in his recent war of words with President Trump—Kim called Trump “mentally deranged” in response to Trump’s personal attacks against Kim in his tweets and speech to the U.N. General Assembly in September—it would take a very brave North Korean official to counsel dialogue and efforts to mollify Washington and Beijing. Instead, Kim’s use of repression and his conferring of financial benefits and special privileges to loyalists has probably encouraged sycophants and groupthink within his inner circle, fueling his preference for violence and aggression. But he may be reaching a critical point where he has to make a strategic choice. While Kim has avidly pursued nuclear weapons, he is also, in accord with his announced policy of byungjin, deeply invested in improving the North Korean economy—certainly a tall order given the gravity of internal changes, the weight of sanctions, and Beijing’s willingness to apply stronger pressure than we have seen before. Trends in North Korea’s internal affairs, such as greater information penetration from the outside world, loosening of state control over resources and markets, the rise of consumerism, and the growth of a moneyed class, will also place severe stresses on the Kim regime. At the same time, international pressure on North Korea has never been greater. A number of recent actions have the potential to squeeze North Korea’s ability to earn hard currency for the regime to fund its economic and military goals, including: recent U.N. Security Council resolutions, such as the latest UNSCR 2397 in response to North Korea’s ICBM test in November; successful U.S. efforts to compel countries—including China—to cut off trade and financial links with North Korea; and President Trump’s September 21, 2017 executive order imposing new sanctions on North Korea (and authorizing broad secondary sanctions). These efforts also have the potential to undermine Kim’s ability to reward elites and suppress their ability to make money for themselves or raise money for loyalty payments to the regime. The combined weight of all these pressures, internal and external, on North Korea, coming precisely at a time of rising expectations within the country, may overwhelm the regime—unless Kim learns to dial back his aggression. That, of course, is a big if. We should be concerned about Kim’s hubris. In 2012, when Kim gave his first public speech, he ended with the line, “Let’s go on for our final victory.” At the time, despite the fact that it was delivered against the backdrop of a military parade featuring the biggest display of Korean weapons ever to have been seen by the world, it sounded to me like the bluster of a new, young leader. For all we know he may have been posturing then, but given recent developments and Kim’s likely increased confidence about his ability to call the shots, the U.S. and its partners and allies, including China, must be clear-eyed about the potential for Kim to shift his stated defensive position to a more aspirational one. I still agree with the U.S. intelligence community’s assessment that “Pyongyang’s nuclear capabilities are intended for deterrence, international prestige, and coercive diplomacy,” as the director of National Intelligence testified in early 2017. But I believe it would be a mistake to extrapolate Kim’s future intentions from his past pronouncements and actions because we do not and will never have enough information about North Korea’s intentions and capabilities that will make us feel certain about our understanding of Kim. He and his country do not exist in an ahistorical space that is unchanging and static. Our analysis and policy responses must also change and evolve and be prepared for all potential scenarios. We, too, must avoid edging toward hubris. Even as we parse every statement issued by North Korea, the country’s media content, the satellite imagery of its infrastructure, the state-sponsored videos, and the testimonies of defectors, we must remember that Kim is watching us as much as we are watching him. The U.S. must work to minimize the threat of North Korea’s nuclear weapons program without fueling conditions that could invite unintended escalation leading to armed conflict. The U.S. has opportunities to reshape Kim’s calculus, constrain his ambitions, and cause him to question his current assumptions about his ability to absorb increasing external pressure. As I have written elsewhere, we can still test Kim’s willingness to pursue a different course and shift his focus toward moves that advance denuclearization. We can do so through strengthening regional alliances—especially with South Korea and Japan—that are demonstrably in lockstep on the North Korea issue. We can also increase stresses on the North Korean regime by cutting off resources that fund its nuclear weapons program and undermine Kim’s promise to bring prosperity to North Koreans, and ramp up defensive and cyber capabilities to mitigate the threat posed by North Korea against the U.S. and its allies. We should also intensify pressure on the regime through information penetration, raising public awareness of Pyongyang’s human rights violations, and create a credible, alternative vision for a post-Kim era to encourage defections. Kim Jong-un is still learning. Let’s make sure he’s learning the right lessons. Jung H. Pak is a senior fellow and the SK-Korea Foundation Chair in Korea Studies at the Brookings Institution’s Center for East Asia Policy Studies. She focuses on the national security challenges facing the United States and East Asia, including North Korea’s weapons of mass destruction capabilities, the regime’s domestic and foreign policy calculus, internal stability, and inter-Korean ties. She has held senior positions at the Central Intelligence Agency and the Office of the Director of National Intelligence. Prior to her work in national security, Pak taught U.S. history at Hunter College in New York City and studied in South Korea as a Fulbright Scholar. Available on: Amazon, Barnes & Noble, Google. Apple, and on Kobo. 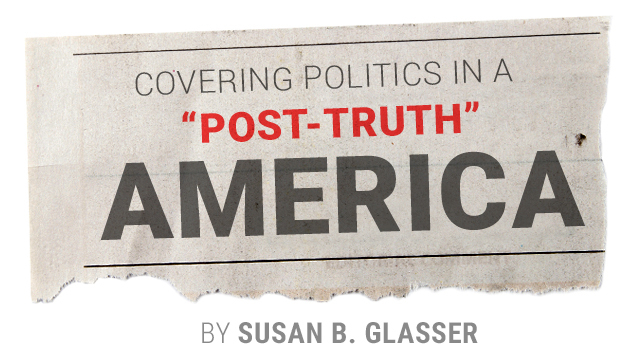 Now more than ever, facts and research matter. Sign up to get our best ideas of the day in your inbox.